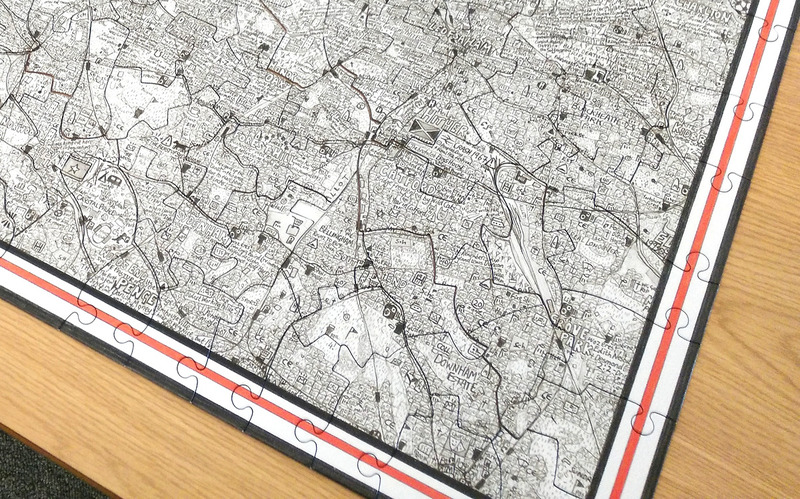 Mapping London has long enjoyed Stephen Walter’s fabulously detailed, painstakingly created pencil-sketch maps of London, and now one of his most famous works, The Island, has been made into a jigsaw puzzle. It was launched late last year by publishers Prestel UK and comes as a 400-piece work. 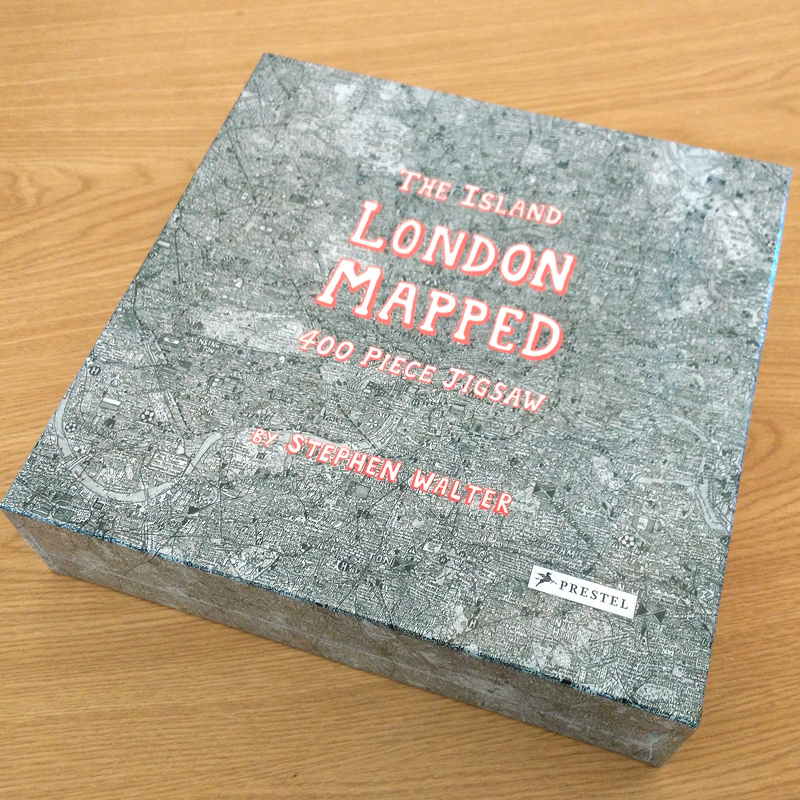 The team at Mapping London Towers likes to think that it knows London’s geography pretty well – after all, we’ve reviewed over 300 other maps here so far. So we assumed that completing this puzzle was going to be straightforward, something to piece together in a short break. How wrong we were – it took three of us nearly six hours each (over three long lunches) to complete the puzzle. 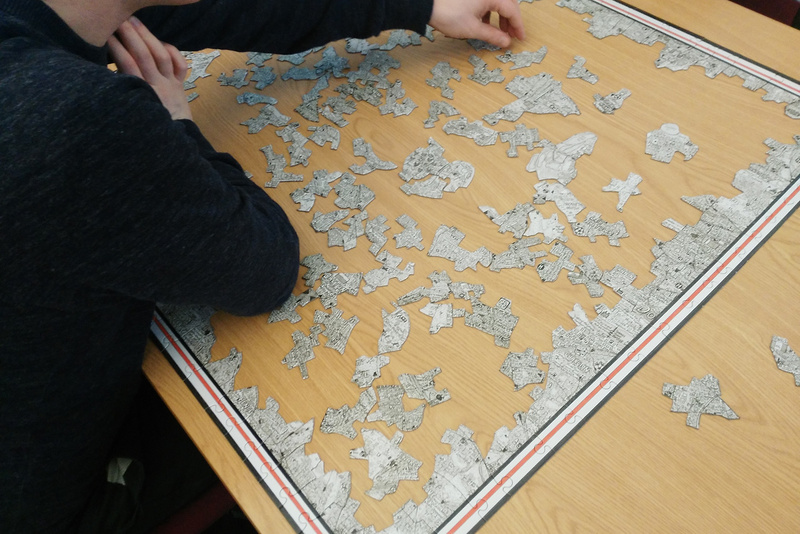 There are various challenges making it harder – the map is black and white, which means there are no colour clues, apart from the red banded pieces forming the edge of the puzzle. In addition, as a semi-autobiographical work of the creator, some of the place names are spelt in local vernacular or slang. So going by simple place names is harder than you might expect. Conversely, if you have a good knowledge of historical spots in London, some demographic statistics (such as the area with lowest life expectancy) or can recognise flags and know which London neighbourhoods the corresponding nationality has an established community in, then this can be invaluable. Subtle changes in the density of the penciled buildings can also help. Stephen was never afraid to voice his opinion on many areas, and even be downright derogatory about some of them – perhaps sometimes deserved. But you really need to know London’s rough as well as its smooth, for these to help with the task of solving. The jigsaw puzzle pieces themselves are also unconventionally shaped. The edges tend to follow the edges of physical features, such as parks and rivers, or the national flags and placename labels drawn on the map. 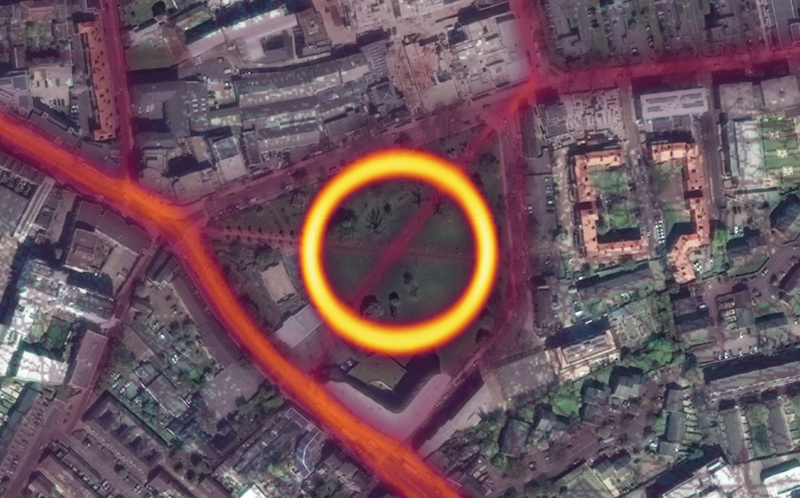 This might, we thought, make it easier, but even with “obvious” shapes such as the Thames horseshoe curve around the Isle of Dogs, finding the adjacent pieces was still involved. It does also mean the puzzle doesn’t hold together quite as well as a regular jigsaw, until it is completed (as the border pieces do have the normal, secure interlinking). This was a great way to get better at the geography of inner London (approximately Zones 1-4 are covered). And solving a puzzle is great way to focus on some of London’s cultural and historical trivia. The suburbs have just as many jigsaw pieces as the better known central area. 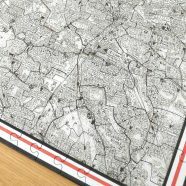 If it all gets a little bit tricky then there is a sheet included in the box which shows the completed map and the piece outlines. Some tips from us: First complete the puzzle edge, then try and work along the Thames, as far as you can. We also found that spotting major railway lines was useful, as these tend to be straighter than everything else in London. Motorway end signs were also surprisingly useful, as was, as noted above, a working knowledge of flags relating to London’s international community foci. 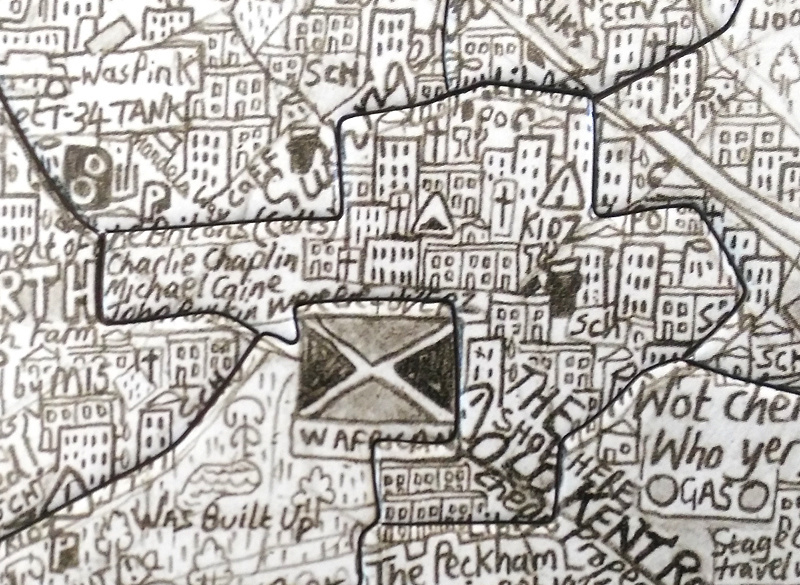 Finally, Stephen’s drawing style changes slightly from place to place – areas of the north-east have a noticeably lighter pen-stroke than elsewhere, for example. The Island: London Mapped jigsaw puzzle is available from Amazon and comes highly recommended – definitely one of the most enjoyable cartographic pieces we’ve reviewed. will almost certainly make you realise you know the capital a lot less than you thought you did. Thanks to Prestel UK for sending a review copy.